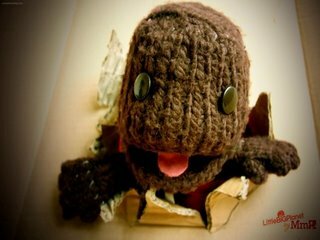 Last week on October the 21st, I got up a little bit early to head out in search of a copy of Little Big Planet. Sure, I knew that the title had been recalled because of some sort of offending song but I was hoping to find a retailer that hadn't heard the same news yet. I tried Target first, where they had copies in, but their computer told them it was not to be sold until November 7th. My next stop was Fred Meyer, which actually had a sign up saying they wouldn't be selling the title. I drove across the street to Sears where the salesman laughed and said "We never get games the week they're out, man". I called around a bit more, but everyone else was abiding by the recall. Flash forward to this Saturday, I'm browsing around the internet for news on when Little Big Planet might finally be released and I find a story on Joystiq that says it's out now at Gamestop. Excited, I call the closest store, only to find that they're only selling to pre-order customers. I call 4 more Gamestops before I find one (which used to be an EB Games) that is selling copies to normal folks like me. I asked Heather if she wanted to go for lunch, then we rushed down to the mall. They had 2 copies left...and I bought one of them. When I got the game home, it was a lot of fun. I played for hours and hours, enjoying the offline modes. I couldn't connect to the servers to experience the online features of the game, and I thought this was strange...but assumed maybe they were keeping them off until everyone could buy the game. It's a fun little platformer, some of the levels caused me to curse and yell at the screen (always a good thing). Others were so fun and cutesy that I breezed right through them. On Sunday, the online features still weren't working, but I put a few more hours into it anyway. Monday, I read reports online that the servers were up, but by the time I finally got home from work last night....they were broken. Today is Tuesday the 28th, a full week after this game was scheduled to ship...and the online mode is still broken. I'd love to give the game a full review, but I can't....because half of it doesn't work yet.